A biorich plantation bridges the gap between environmental plantings for habitat and farm forestry for landholder use and profit. Established in 2010 as a demonstration site by Ballarat Region Treegrowers, the 15ha ImLal biorich plantation site has a biodiverse core replicating the original natural forest with species diversity of over 40 plants and five structural layers as once found in swamp woodland at Lal Lal, south-west of Ballarat. Clumps of commercial forestry trees, such as Otway and Sydney blue gum, bulk out the biodiverse core not only optimising biodiversity, but also providing resources to the landholder for farm use and income diversification. The aim is to develop a sustainable treegrowing model that integrates conservation and production. We want to build resilience into both the landscape and the landholders. Only then can landholders act as custodians, caring for their country. Comparison between ImLal South in 2010 and March 2017. Site design for ImLal was by Recreating the Country author, Stephen Murphy, with input from Phil Kinghorn on forestry trees. Stephen has now set up his own website on biorich principles – click here. Bird surveys aim to check the level of biodiverse abundance and variation on a seasonal basis – see Bird surveys. Contact Us if you want to come along on future bird surveys. A paper on Biorich design principles and the silviculture implemented at ImLal over a 4yr period can be downloaded from the Publications menu. Find out about the BRT's film Rediscovering the Country on community-led landscape restoration. It has its own Facebook page – see here. A history of the ImLal site follows the Further Info panel. This website is hosted by Ballarat Region Treegrowers (BRT), a branch of national farm forestry organisation Australian Forest Growers (AFG). The Background page and Publications menu offer information on the development of the biorich concept. A picture gallery shows growth over the past couple of years. 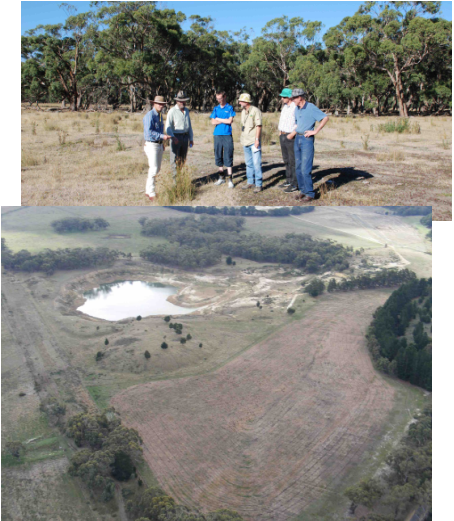 [Below] 4.5ha south site; [Top] 5ha north site above dam. The demonstration plantation is within the Imerys Mineral kaolin mining site buffer zone at Lal Lal. “It aims to demonstrate the importance and potential of combining biodiversity with farm forestry on a large enough scale to really make a difference,” said Phil Kinghorn, past President of Ballarat Region Treegrowers, which is the lead organisation for the project. A wide range of partners are involved including Australian Forest Growers (AFG), the Federal Government’s Caring for Our Country program, Federation University, Imerys Minerals, Central Highlands Water, Corangamite CMA, Koala Connect and Moorabool Shire Council. 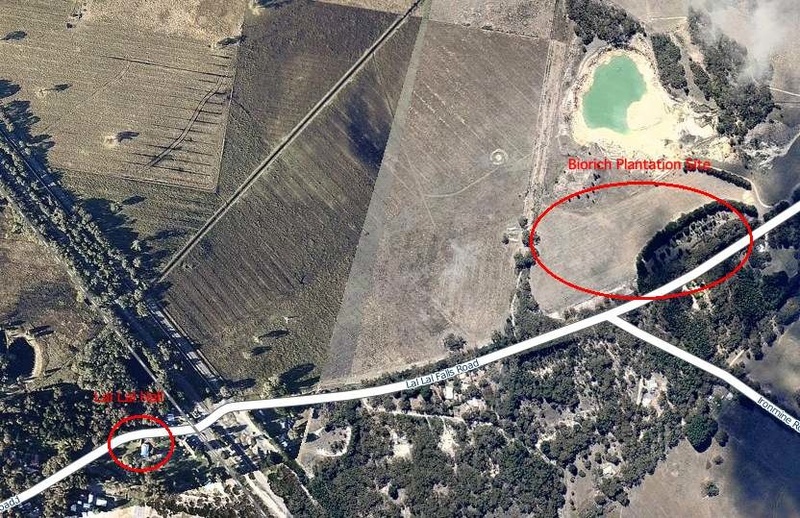 Half of the proposed 10 hectare site was planted to the south of the dam (pictured right) in October 2010 by local landowners, Landcare and AFG members with over 40 species (over 3,000 plants) plus 10 clumps of forestry species including blue gum (both Sydney and globulus), red gum, spotted gum and blackwood. The other half of the site to the north of the dam and a band of remnant swamp gum woodland (pictured top) was planted in September 2011 with 42 species and over 4,000 plants. When combined, the two wildlife-friendly biorich plantations and the remnant woodland between them create a 15ha habitat refuge, as well as having the potential to provide renewable resources and future income from the timber trees. The partners in the project consider that the biorich model addresses all three sustainability issues – social and economic as well as environmental. Site owner Imerys Minerals Ltd is a worldwide kaolin clay mining company. Imerys Australia’s General Manager Colin Bullen sees the biorich concept as having "exciting potential" in the reclamation of Imerys’s mining sites globally (refer to his Field Day presentation). Imerys is negotiating the granting of a 15 ha lease incorporating the two biorich sites plus central hill, dam and remnant woodland to Federation University and Australian Forest Growers in order to ensure the site's long term future for research and education. 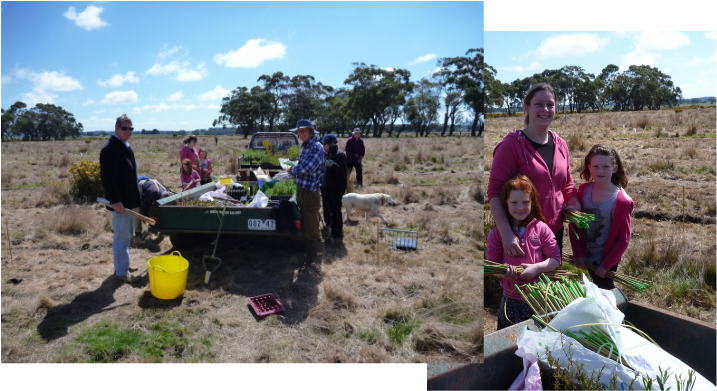 Fifteen people from Ballarat Region Treegrowers, landcare groups, Imerys Minerals and Ballarat University took part in planting out 5ha with over 3,000 indigenous shrubs, trees and grasses in the buffer zone for Imerys’s kaolin mine at Lal Lal. The planting of the second stage of the 10ha ImLal Biorich project took place in September, 2011. Almost 800 forestry trees were planted along access tracks including a stand of Californian redwoods. In October 2012, gaps in ImLal Nth were replanted with over 2,000 trees and shrubs plus 1,200 grasses. Growth rate and mortality, however, remains high in ImLal Nth – possibly as a result of failing to slash grass prior to control spraying. Stephen Murphy (on right) with Imerys Environment Manager Brad Haywood. 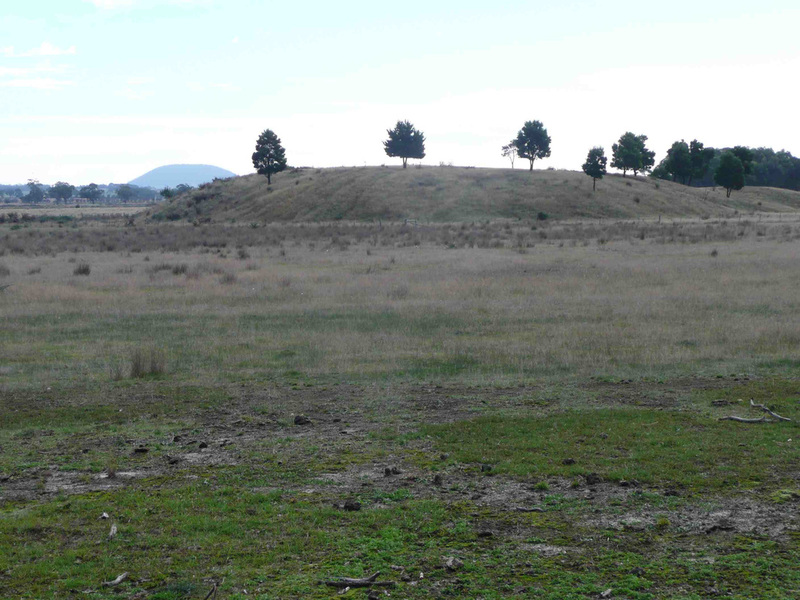 The biorich site puts into practice the revegetation design principles outlined in the well-received, AFG published book, Recreating the Country. Author and ecologist Stephen Murphy designed the planting of the site in concert with advice on forestry species from Phil Kinghorn from Ballarat Region Treegrowers, the local AFG branch. The design’s most unusual features are the large range of plant families incorporated and that all plant layers are present from grasses to shrubs, understorey and canopy trees – see his report on the Site design page and his Field Day presentation. Overseas in places like Sri Lanka, restoring degraded landscapes by mimicking the natural forest that was once present, then adding productive crops, such as tea or coffee, comes under the heading of analogue forestry. Analogue forestry differs from agroforestry in that the former starts from the premise of optimising biodiversity, then adding locally appropriate productive elements. Ballarat Region Treegrowers has applied and been accepted as the first Australian organisation to become a member of the International Analog Forestry Network, whose head office is in Costa Rica. Tanya Loos (left) with BRT bird surveyors on a typically grey and windy morning. Writer and ornithologist Tanya Loos has led 20 bi-monthly bird surveys on a transect across the biorich sites. She points out that the range of bird species that come to use the site will act as an environmental indicator of its success in bringing back native wildlife – see her report on the Bird surveys page and paper on the Field Day page. Plot monitoring of plant growth and mortality is being undertaken by Federation University. Seven months on, graduate student Tim Simpson was able to report that the south site had a 95 per cent strike rate. While it has continued to flourish, planting on the north ImLal site has not fared as well. Federation University senior lecturer Singarayer Florentine, an expert in reforestation, told those attending the field day that, in general, there is increasing evidence that the greater the plant diversity, the greater the resilience and long term success for environmental and forestry plantings – see his report on the Plot monitoring page and paper on the Field Day page . Local water authority, Central Highlands Water has provided funding towards the revegetation because it is interested in the site's impact on water quality. Natural resources manager Sonia Mahony spoke at the Field Day about how native vegetation filters and improves the quality of water. Central Highlands Water is increasingly planting native vegetation on streamsides and around its reservoirs. The water authority sponsored tubestock indigenous planting of the north site.